Balm, Color, Gloss. This is the routine most ladies go through every day, me included. One of the ways I've cut down my makeup routine in the morning is the Revlon Colorburst Lip Butters. I remember when they first came out, they were sold out almost everywhere because it became so popular so fast! However, once I finally got my hands on one I understood why they were so popular. These really are all-purpose lipsticks - balm, color, gloss - all in one! The moment you put it on, you'll notice a real difference in your lips and it even claims to improve your lips over time, which I could agree with being a frequent lip butter user myself. Also, there is a decent range of colors to choose from. 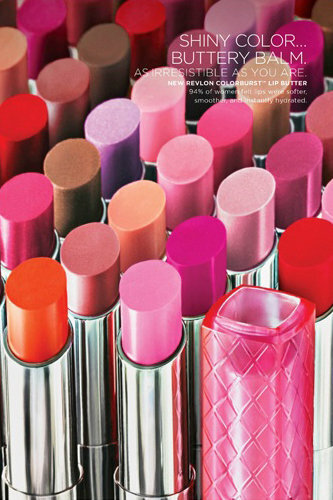 You have your pinks and reds, plums, and even nudes. The colors are pretty true to color but they are also sheer, so it's not that vibrant on your lips. This isn't the lipstick I would go to for when I want my color to be fade-proof either. I have them in Candy Apple (035), Creme Brulee (095), Peach Parfait (025), Pink Truffle (001), Sugar Plum (085), and Red Velvet (040). As you can see, I LOVE my lip butters. These can be purchased in any drugstore - Target, Walmart, CVS, Rite Aid, etc. and are fairly inexpensive ranging from around $6 - $8. The reason I say they're inexpensive is because it's an all inclusive lipstick! So, if you're looking to cut down on your morning makeup routine or hate carrying multiple lip products when you're out & about then this is the perfect solution to you. Has anyone tried these lip butters or any other lip butters? What are your thoughts? **Disclaimer** I am not getting paid or sponsored to do this review. These are my honest opinions and I am in no way affiliated with Revlon.